I have been a fan of Dr Sandra Cabot’s liver cleanse diet for some time now. And about two years ago I set myself the challenge of taking on the strict diet for two months. For the most part I stuck to it as well. I remember right near the start of the eight weeks I was invited to a friends place for a big curry night. What a nightmare. But I made sure I was prepared and brought along Vietnamese rice paper rolls for my dinner and avoided the coconut cream based delicious curries. Of course saying no to Naan and the Vindaloo was awful, but I resisted. In the midst of the cleanse I don’t think I’ve ever felt healthier in my life. It’s a really sensible way to eat. If I could keep it up all year round I think I would. Of course there is a glimmer of “probably” in there. Who doesn’t like creamy lindt milk chocolate? So the basics of the diet: no fats (I have since learnt that “good fats” are ok – so olive oil, avocadoes, oily fish are all fine), no refined sugars, no processed foods, cut back alcohol consumption to just a few units per week, restrict caffeine intake – I usually had one coffee or tea per day, plenty of water or green tea. No red meat. Lean chicken is ok. No dairy (although I plan to have a little milk in my tea from time to time). They are the basics. For the most part I found the diet easy to stick to. One of the things I liked best was my morning breakfasting. It all starts with a glass of water with lemon juice first up. Followed by one or two glasses of vegetable juice – I chose the V8 variety for convenience. About half an hour later I would have two pieces of gluten-free toast with avocado and tomato. Delicious! What I found that helped me stick to the diet was being well-prepared. Having snacks that I could eat throughout the day, or making sure I had something I could either whip up quickly or had precooked in the fridge when I didn’t have much time in the evenings. Haha – I know. It all sounds very do-able when you’re not attempting it. I’m now sitting here in my lunchbreak munching on an extravegant meal of creamy pasta with chicken and bacon and tomatoes and it is delicious. I know I am going to miss this when it’s gone. The first week I found difficult – I had cravings and headaches and felt pretty awful as my body got rid of the toxins. But after that point it was much easier. Cleanse begins this coming Sunday! So this week is my last hooray! Bring on the cheese!! Thursday of the week just gone was a public holiday for the whole of the country in Australia. A day synonymous with bbqs, inflatible pools in the backyard and Triple Js Hottest 100 countdown. In Brisbane it was cloudy and ridiculous amounts of humid. It followed a few days of constant and relentless rain so the steaminess was right up there. Instead of a bbq a friend organised breakfast at the Gun Shop cafe in West End and it was packed and happening. We sat out the back and discussed how great it would be for a function. I’ll pencil it in as an option for my going away, or wedding perhaps. Breakfast was great but we were all melting. I had a long mac and muesli with summer berries. Not my usual pick. But delightful. Then after all there was to do was stay cool. 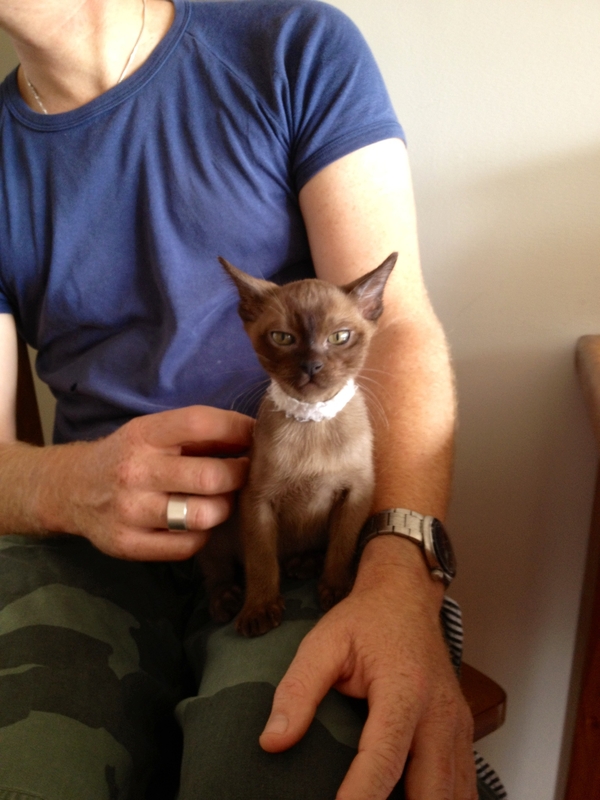 For me that involved hanging with Riga the gorgeous friends new kitten. 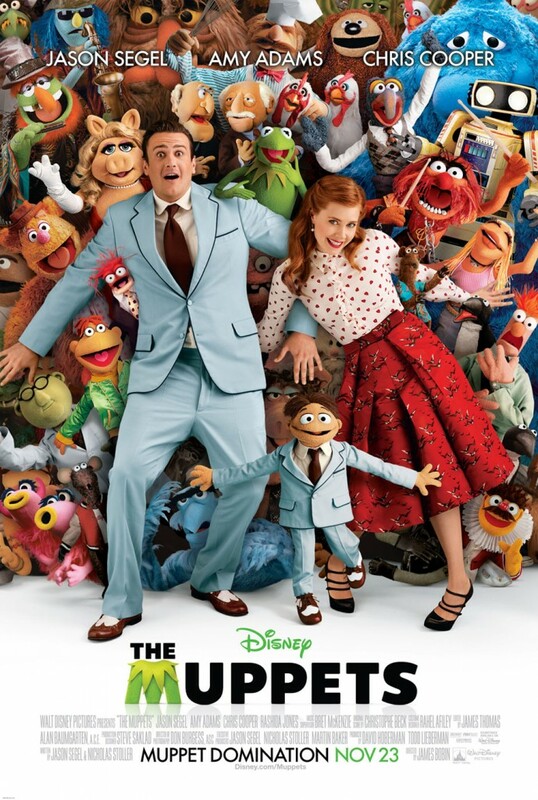 Then the movies with S. We went to see The Muppets that one of my friends in particular has been waxing lyrical about for weeks now. It was loads of fun, and the tunes were so catchy and wonderful. We had a great time. In the evening my viewing took a completely different path and I watched Tinker Tailor Soldier Spy with Gary Oldman – it was fantastic. A slow burn, wonderful performances. I think it deserves a second watch as many of the characters were only mentioned by first name and I had a bit of trouble keeping up. What films have been taking your fancy lately? I just couldn’t resist a few books on Sunday at the Bookfest. Six books for $15. Bargain. I’m pretty impressed by my purchases. I have read Saving Francesca and The Girl Most Likely before. They are light easy reads I’m happy to re-read. The kind of books I like to have within easy reach that can be picked up, flicked through and re-live the best bits again and again. I’ve been re-reading a bit of Nick Hornby’s High Fidelity of late. There are so many quotable quotes. It is a hilarious book. 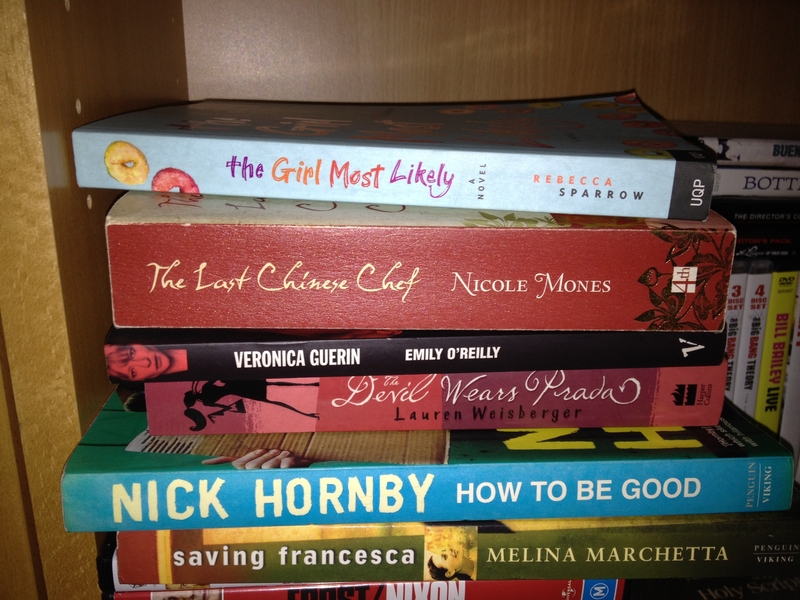 I mostly enjoy all of Nick Hornby’s books. I think High Fidelity is my favourite so far though. How To Be Good was one of the few of his books I saw at the sale. I have read one other Nicole Mones book for Bookclub a couple of years ago which was Lost In Translation. I read the blurb for The Last Chinese Chef and it sounds really interesting, and I know some of my ex-bookclubbers would really like to take a look at it. I recently watched the film adaptation of Veronica Guerin and found it entirely chilling and fascinating. Hoping the book will include some more details. And finally for some sass (hopefully) and fun The Devil Wears Prada. I have started any of my books yet as I’ve been caught right in the middle of the thrilling ‘Before I Go To Sleep’ by SJ Watson. I tried to resist the Bookfest. Honestly. Until the final day. And then I cracked. I was talking up Bookfest to such an extent to a friend who had never been before, it tweaked her interest and she asked me if I wanted to tag along. And so that’s where we ended up with a couple of other friends. A few of us hit up Grill’d Burger first (their burgers are so divinely tasty as I have talked about before especially the Hot Mama) and mused over a couple of drinkies at the pub next door. Then onto the books! I ended up with about six books, but I put alot of interesting ones back on the benches knowing all too well I really don’t need them. I’m moving out of my unit soon, and I don’t need any extra junk to box up and take with me. 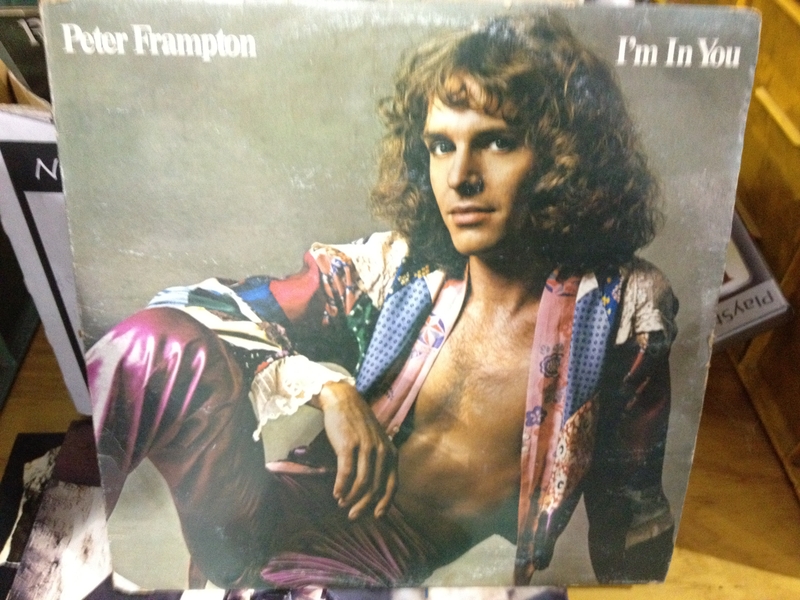 The best non-purchase of the day however has to be this record. What a cover! 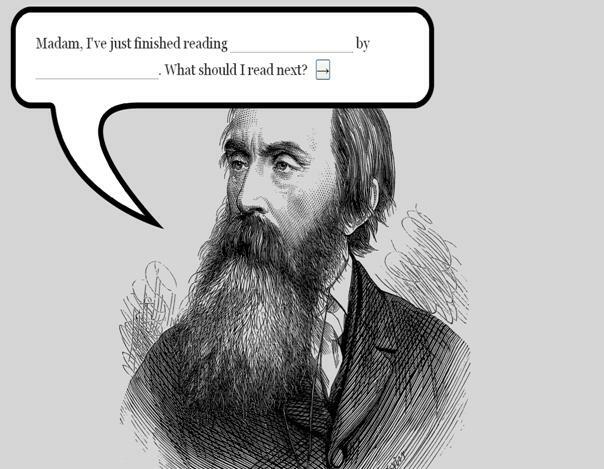 Have you just finished reading an extraordinary book and are puzzled as what to read next? Let this very helpful website suggest titles for you. I love it! Find it here. That quote comes courtesy of Albert Schweitzer. Although torn between cats and dogs, I’ve always been more of a cat person. I love their independent nature. I love how many hours a day they can sleep. I love how they will find the best spot inside or out, warm and soft. I love their soothing purr. They make me happy. 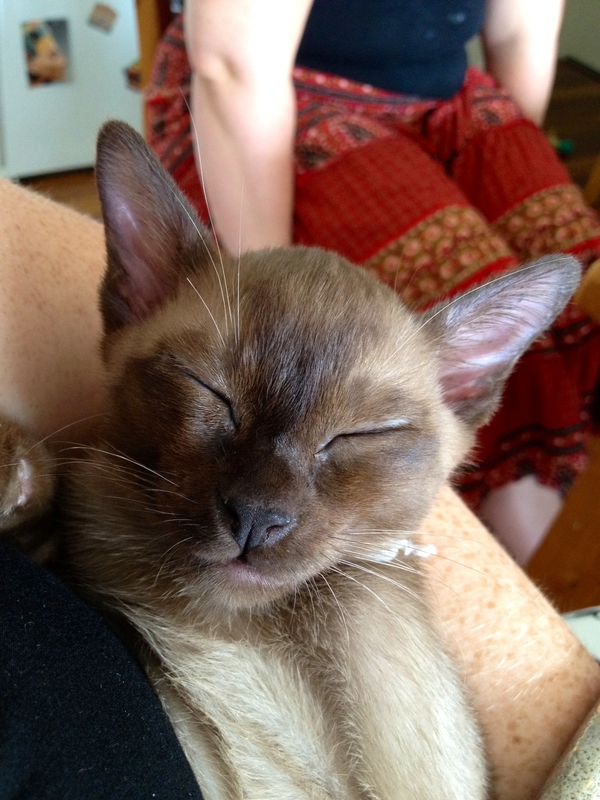 So I’m thrilled that my good friends, S and L, just received their furry little Burmese kitten this weekend! I got to have a snuggle with him on Sunday morning with breakfast. His name is Riga, named appropriately after the capital city of Latvia, a place that my friends fell in love with on a trip they made last year. Isn’t he adorable?